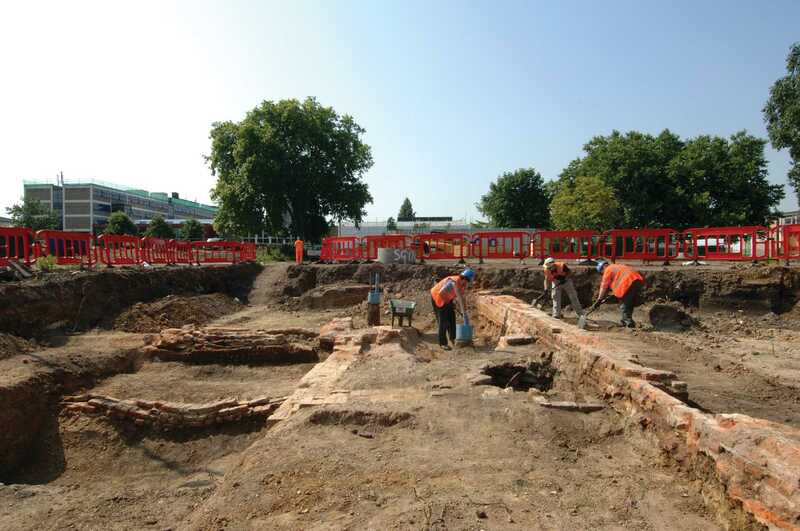 Excavations uncovered the remains of a 15th-century moated manor house. King John’s Court or Palace was home to the wealthy Fenne family. From the early 17th century it became known as Worcester House after its owner the Marquis of Worcester. During the English Civil War, it was confiscated and passed to Maurice Thompson, a merchant, Puritan and parliamentarian. Under his patronage the Stepney Meeting of religious non-conformists was founded in 1644. In the 1660s, the manor house and grounds were divided, with the then pastor of the Stepney Meeting, Matthew Meade, living in part of the house. He built a separate meeting house in the grounds. A college, church and school were later added, the latter two surviving until they were damaged by bombing in the Second World War. The college was demolished in the 19th century and the site used for terraced housing.